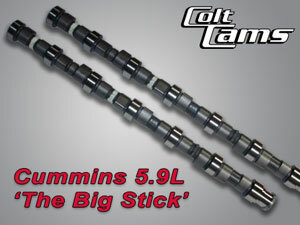 Colt Cams is proud to introduce our latest grinds for the Cummins 5.9L B series engine! We've worked long and hard to develop these great new profiles. We've dyno'ed some 50 different combinations of durations, lobe separation and installed centerlines to come up with the ultimate cam for your Cummins 5.9. We have a large quantity of new cast billets in stock ready for you! Our 5.9L Cummins cams are available in 6 stages. We are always willing to customize alternative grinds as well. Stage 3: Nicknamed the "BIG STICK". It has gained the most popularity. This cam delivers the strongest mid-range torque and H.P possible, but still has good bottom end and drivability. No mods are required, but we do recommend a set of springs. Key in this position retards cam. for best Results and piston clearance. Valve clearance required. Full race / sled pull, good to 6000 rpm. Always use new or re-crowned lifters! The cost for us to re-crown yours is $75.00 USD. If using C.R. lifters with larger head, (also heavier) make sure it clears the fuel pump lobe on # 5cyl., especially on the 12V engines. C.R. blocks are ok but you should still check. If your gear is not pressed on all the way, the lifters could touch.